Rain's Garden: Goodies In The Mail and Cherry Bounce! Isn't this hummingbird beautiful? This is just part of a gift box I received from my sweet Blogger friend Joyce at Octoberfarm. When Joyce told me she was sending me a surprise, I was thrilled! The hummingbird is part of a mirror chain, homemade by Joyce! My photo does not do this justice at all! Alex and I tried to find a spot to put it but we had nothing high enough where the curious dogs couldn't reach, so I folded the chain in half. It's almost taller than I am! This is just the temporary home until we can get up a little higher! The sun shines on the mirrors and makes pretty reflections all over the yard! 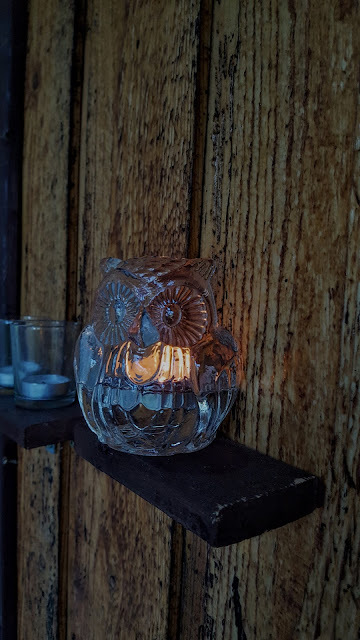 I also received a lovely cozy looking matchbox with an owl candle holder! Joyce said I worked hard on my porch and I deserved a gift. I never expected this! Another package in the mail was my cheese making supplies. Yup, I'm going to become a master cheese maker! (ahem...we'll see!) I bought a kit for Cheddar, and the fixins for Mozzarella - which I'll try making first. I'm really getting into the cheese making culture (no pun intended)...I'm already planning to make Brie, Camembert, Gouda and Blue Cheese...only thing is I need a better set up because these cheeses age for around a year or more and need to be in a humid and temperate environment. There are solutions if you don't have a "cheese cave" (I WILL have one next to my wine cave in my dream home!! )...I have to read up on that some more! 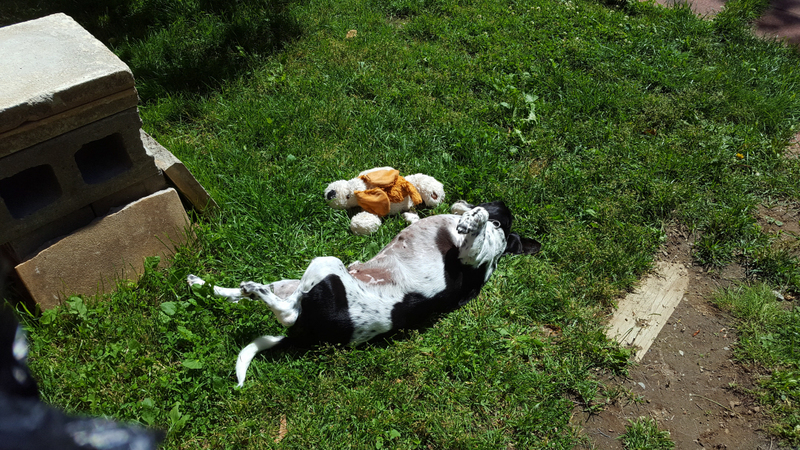 Jack is happily rolling around in the grass with his toy/prey "Mr. Curly"...I think we named the toy that when we were watching lots of Three Stooges lol...anyway, he demonstrates perfectly the joy we're all feeling today! The lovely gifts, the cherries and the sunny HOT weather that has finally arrived in the mountains!!! So many goodies! My favourite is that hummingbird. It is very beautiful. Cherries...on how I love them. I don't buy them as often as I like because they are usually very expensive. I'll have to check the local stores this week for sales. I may have missed them already! Hi Martha! :) The flyers here change every Thursday. Last Thursday there were cherries all over the place for $1.99 a pound...I checked out all the flyers that switch tomorrow and they're anywhere from $3.99 to $6.99 a pound now! Aaaack...too expensive! I learned from last summer though! We bought enough so that I can freeze some so that we could make more Cherry Bounce in the winter, at least they'll still be nice and sweet and since we cook them, the texture doesn't matter at that point. so glad your box arrived and you like your gifts! jack looks like he already got into the cherry bounce! 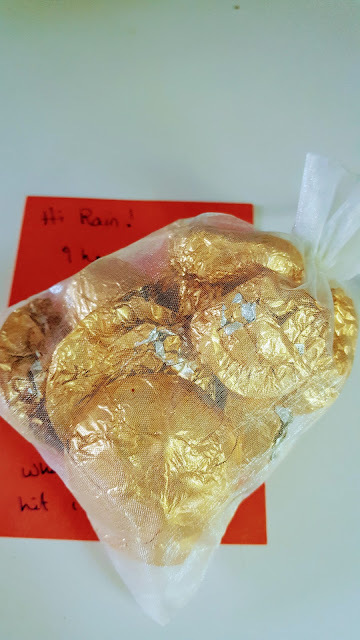 What a wonderfully thoughtful FUN package you received! Isn't it delightful to get "surprise" packages . . . and even a handwritten card (I MUST get back into doing that . . . maybe this winter, sigh) in the mail. Our Internet correspondence is wonderful but there's something so special about getting a package or letter we can hold in our hands. 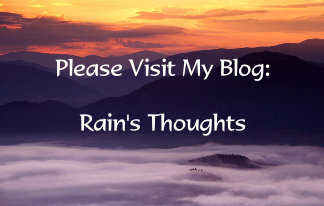 Nice-ness is as nice-ness does, Rain, and you're one of the nice-est! What a fun and thoughtful surprise you got in the mail! I just noticed sweet cherries at the store the other day. We planted a cherry tree, but won't have them for a few years. Yum. The cherry bounce sounds wonderful. Joyce is such a sweetie! How nice, that hummingbird is gorgeous! Isn't getting mail fun, I send random cards to my sisters just for fun. A cheese cave...I love that idea. That should be the next big thing in new homes. Seems like it would go well with a wine cellar! Glad to see all is well up there. I like your crystal humming bird. 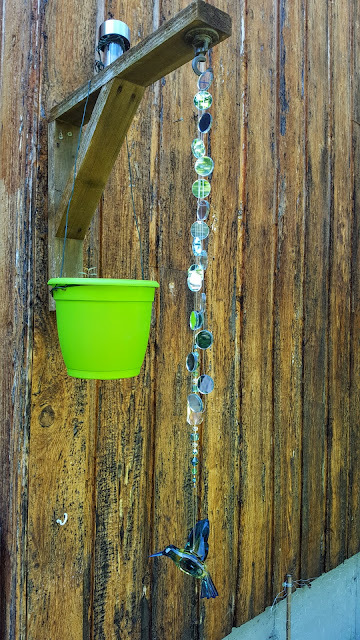 My wife collects little things like that and hangs them up outside in spring and summer. 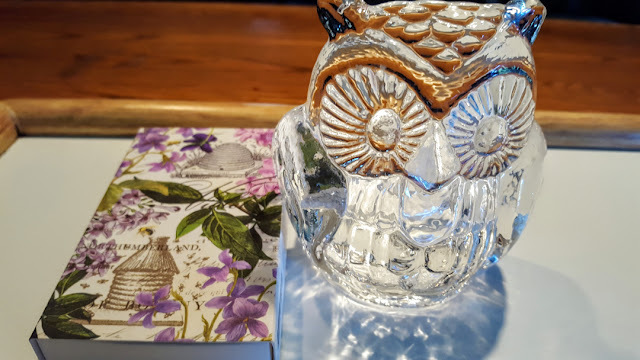 what beautiful gifts that joyce sent you! 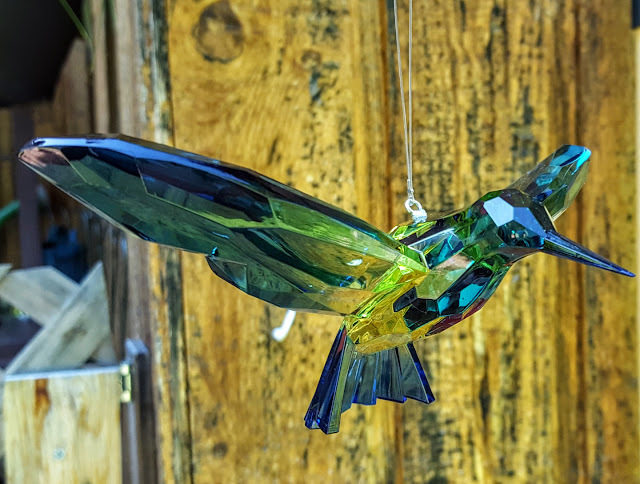 i love the mirror chains that joyce makes- they are so beautiful but that hummingbird is gorgeous! and the owl and the matchbox - such thoughtful gifts! you mention you are going to start making cheese and i am drooling - i saw all of those cheesy appetizers in your last post and nearly cried! i am slowly introducing older and fermented cheeses but jambaloney will have none of it. but i have to have some gooey cheese every now and again!!! i can't wait to see how your cheese turns out! as for the cherries - you are like us. when something is in season, we stock up and either freeze, can or dehydrate. we just went through asparagus season and we got a ton! we ate a ton of fresh asparagus over the last few weeks and froze a bunch. some people don't like frozen asparagus but i will do with soggyish fresh-local asparagus in december! i have never heard of cherry bounce so will have to look it up! We had a large cherry tree in our small backyard when I was growing up. Towards the end of the season we had to give many of the cherries to the family and neighbors before the worms got to them. Cherries are one of my favorite fruits. The temperature and humidity control for the cheese makes a huge difference in the ripening of the flavor. I need to up my game with a wine refrigerator in the near future. 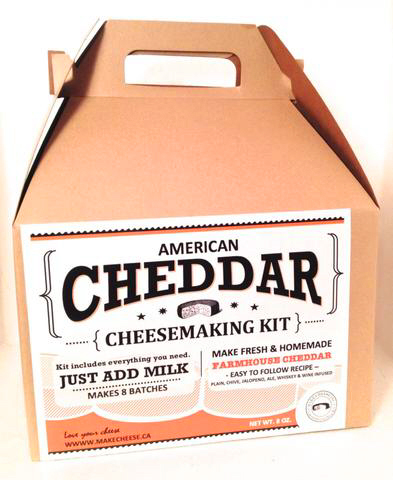 I've never heard of a 'cheese making kit' before. It sounds cool to be able to make all of them. My Favourite cheese is Double Gloucester which isn't featured there. That's too bad. But it still sounds like a good idea to make your own. I'm disabled. Don't be put off by that. Nobody else is. Hi Mama Pea :) I feel the same way, there's nothing like a handwritten note. I feel like my handwriting has suffered lately because of the typing, I try to write by hand every day to keep it up, how sad! Hi Kristina :) The cherry bounce can also be made with brandy, or any kind of whisky, we chose rye. I can't wait to try it out! Hi Debra :) You're so right :) I find the people I've met through Blogger to be much nicer than lots of the people I've met in person. I wonder why that is? Hi Jenn :) I love cheese too. Thanks, I'm going to test out my luck this weekend with my first few batches. If all goes well, I'll venture into the more advanced cheeses. I just have to keep in mind the "cheese cave" that I need to put together or they won't age properly. Hi Susan :) Oh you're right, the little owl does add to the hygge! 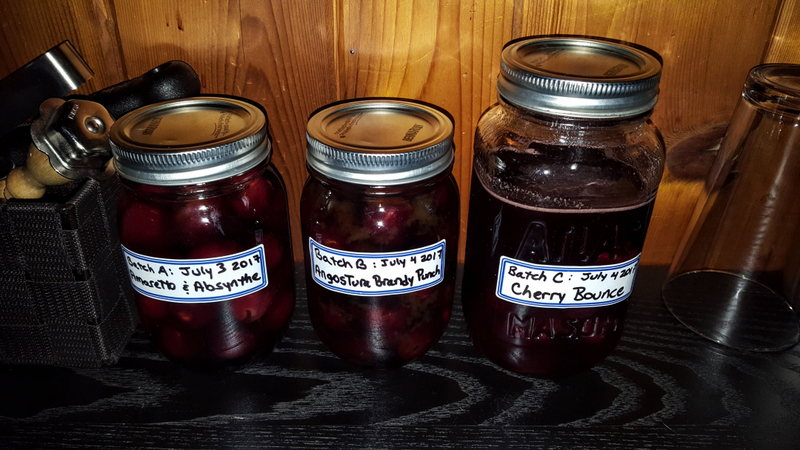 :) For the cherry bounce, we used the recipe on Imbibe magazine's web page. I can't wait to try it out in the winter! :) I'm very excited about the cheese making!! Hi Jenn :) Yes...that's what I want! A wine cellar and a cheese cave! It has to be makeshift here in the rental, but that'll be something that will be built in our new home when we buy! I just wish I could get my hands on a cow...I found some local milk but it's pasteurized, as per the rules here. I'm hoping it doesn't affect the results of the cheese too much! Hi Dianna :) I knew you'd love the cheese box!!! It has a lot of stuff in it...I read the recipe last night and it's going to be a day long venture for the cheddar. I'm going to be making some over the next week or so, I'm going to age one for 3 months, one for 6 months and one for a year! Oooh! :) Only problem is I have to wait to eat it!!! Lol...I can't wait to bounce, ha ha...we smelled it before we sealed the Mason jar, and oh boy does it smell nice and sweet. I can't wait to try it. I found cherries yesterday at $2.99 a pound at a market along the highway. Everywhere else, the prices are rising, so I think I'm done buying cherries this year, too bad though! We stopped buying and eating those neon fake ones in the jars recently because they gave us heartburn. Too much food colouring in those. Hi Kymber :) Well, we absolutely stopped buying grocery store cheese. If we want cheese, it's the good stuff, but it's so expensive! I can't wait to see how the cheese making goes. I think it'll be a success :) There are just so many possibilities. Once you have the equipment and the additives, all you need it a good space to age it. I'm going to figure something out! Even if J doesn't eat the cheese, you can treat yourself! :) The cherry bounce comes from the Imbibe magazine web site. It's super easy! Hi John :) That's pretty lucky to have your own cherry tree. Too bad you don't have one now! When we have our place in the future, I want to set up a big greenhouse and try to grow some fruit trees. It would be lovely to have our own cherries! Hi TB :) I did read that I can use the veggie drawer of my fridge to age the cheddar, so I've cleared that out, oh precious space!! We also have a little "beer fridge" where we keep various beers, wines and some mixers. I'm going to try to convince Alex to turn it into a cheese cave lol...we'll see about that! Hi Nancy :) Nooo! Don't lose your passion for gardening! What ever will Coco do for snacks??? 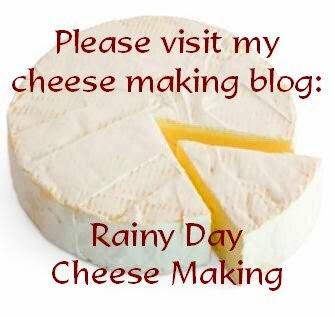 ;) I think my cheese making is part curiosity, part challenge and part need. We love cheese so much but the stuff at the grocery store around here anyway, is just horrible. The other cheeses, the good ones, are so expensive too. I hope it all goes well! Awwww...such nice surprise. Love the little owl. Looks so cute. I can't wait to read about your cheese making !!! !